To succeed at building a comprehensive data warehouse of medical trauma information, Scott A. Optenberg had to devote as much attention to people as he did to data. His concerns were about privacy, credibility and teamwork, as well as coding, Optenberg said. As a professor at the University of Texas Health Sciences Center at San Antonio, he heads a consortium of local and federal officials who mostly donated their time to create a data warehouse prototype. The effort has paid off for researchers in the San Antonio area, who have used the combined data to demonstrate exactly how much speedy emergency medical care raises the survival chances of trauma victims. The data warehouse, known as the San Antonio Metropolitan Trauma Information Registry (SAMTIR), involves three trauma centers in the southern Texas city plus the municipal fire and police departments. Two of the participating trauma centers, Brooke Army Medical Center and Wilford Hall Medical Center at Lackland Air Force Base, are military facilities that also handle civilian medical emergencies. The third center, Bexar County University Hospital, is locally operated. Teams of agency volunteers built the pilot warehouse to test use of an interagency system to track the outcome of trauma treatment for patients at health care facilities in San Antonio. Together, they handle the most critical trauma cases within a 390-square-mile region centered on San Antonio. The local and federal health officials began meeting on their own time about the project in 1998, Optenberg said. He downplayed a federal connection, saying that much of the work was done on a volunteer basis. 'There was, early on, a lot of natural suspicion as to why the federal government would want to do this,' said Optenberg, who has a bachelor's degree in nursing, a master's in health care administration, and a doctorate in statistics and information systems. In his role as an Army medical official, Optenberg earlier designed a data mining application to spot billing fraud [GCN, Dec. 15, 1997, Page 37]. His clinical background and faculty appointments at the University of Texas and two other universities gave him the credibility to get the project going, he said. Alive or dead the idea was to start tracking trauma cases from the initial 911 call to the final outcome'whether the patient lived or died. Those who were tracked had gun or knife injuries, or blunt traumas resulting from falls or auto accidents. Trauma care tends to be compartmentalized, Optenberg said. Police, firefighters, 911 centers, emergency medical and ambulance services, emergency rooms, hospitals and even morgues all keep their own records, but no one in San Antonio was looking at the comprehensive picture of trauma care. Emergency medical technicians knew the patients they transported were alive when dropped off at emergency rooms but did not know whether they lived or died afterward, Optenberg said. Putting together the transport, trauma center and hospital records could give all participants a better idea of their role in the continuum of care, he said. Data comes into the SAMTIR warehouse from various systems. The two military centers use a commercial trauma registry package, Collector from Tri-Analytics Inc. of Bel Air, Md. University Hospital uses another program, National TRACS from the American College of Surgeons in Chicago. 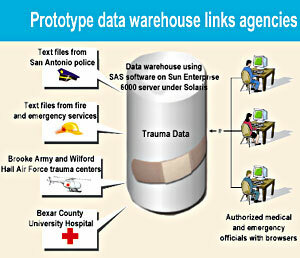 San Antonio public safety officials export their trauma-related data as text files. Optenberg said the data warehouse was built entirely with SAS Version 6.12 and other software products from SAS Institute Inc. of Cary, N.C. SAMTIR uses SAS/Graph, SAS/Stat and the base software's Structured Query Language engine. Queries pass through SAS/IntrNet. The SAMTIR prototype runs on a Sun Microsystems Enterprise 6000 midrange server at the Army Center for Healthcare Education and Studies at Fort Sam Houston, Texas, where Optenberg serves as chief of the Analysis Branch. Optenberg said he designed the warehouse architecture, and engineers of Litton PRC, which held a contract for programming services with the base, turned the specifications into source code. Most of their time was donated, he said. To match records from the source data files, SAMTIR looks at ages, Social Security numbers and geolocation codes used by all San Antonio emergency workers. During development, the SAMTIR team updated the records in the data warehouse monthly. Ideally, Optenberg said, it would be updated more often, perhaps daily. Access to the warehouse is by simple Web browser, but it is tightly controlled because of the sensitivity of the information, Optenberg said. Researchers who want SAMTIR data must apply for permission. The consortium has used the data to study the outcomes of gunshot wound cases. According to the conventional wisdom of emergency medicine, trauma victims who arrive at a care center within the first hour after injury have a better chance of survival. In a study of 304 gunshot wounds, the researchers found that victims of severe wounds had a 25 percent survival rate if they arrived at the hospital within 10 minutes after the 911 call. If the elapsed time was 70 minutes, the survival rate dropped to 16.5 percent. The study results will be published in the Journal of Trauma, Injury, Infection and Critical Care. Optenberg said he isn't sure when the SAMTIR warehouse will be declared operational. It depends on funding, which accrues from a surcharge tacked onto driver license renewal fees. The SAMTIR team hopes to raise enough money within the next three to six months for three full-time-equivalent staff members and a four-way Pentium III Xeon server, Optenberg said. Such a server running Microsoft Windows NT 4.0 ought to be enough for SAMTIR, which doesn't require 'the big R&D machine' it's on now, Optenberg said. Other plans for the data warehouse include adding geographic information system software, such as MapInfo from MapInfo Corp. of Troy, N.Y. The local office of the Texas Department of Health and the Bexar County coroner's office are interested in joining the project, Optenberg said.